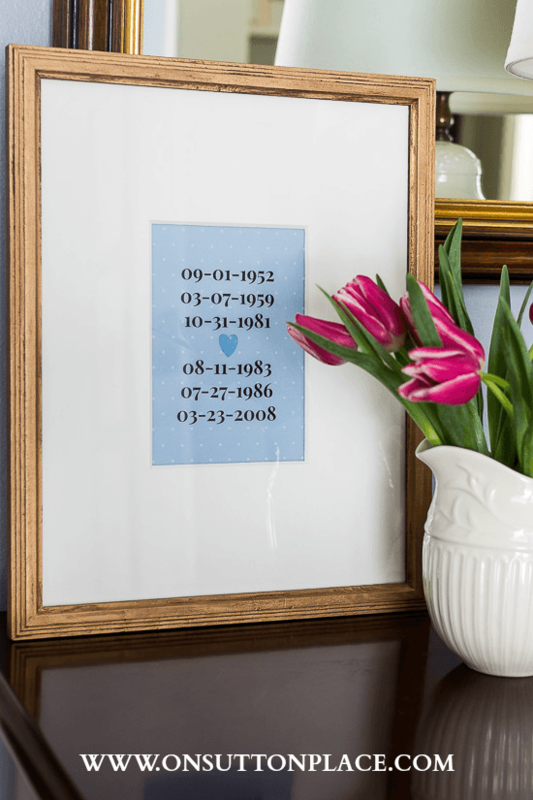 Back when my blog was very new, I did a little post on DIY Date Wall Art that I called Frame The Date. Sadly it did not make it when I moved my blog from Blogger to WordPress. It’s out there floating around in cyber space. Anyway, I made a very big mistake when I made it and have always wanted to fix it. On the original piece I left off the birthday of our little dog, Kelly. 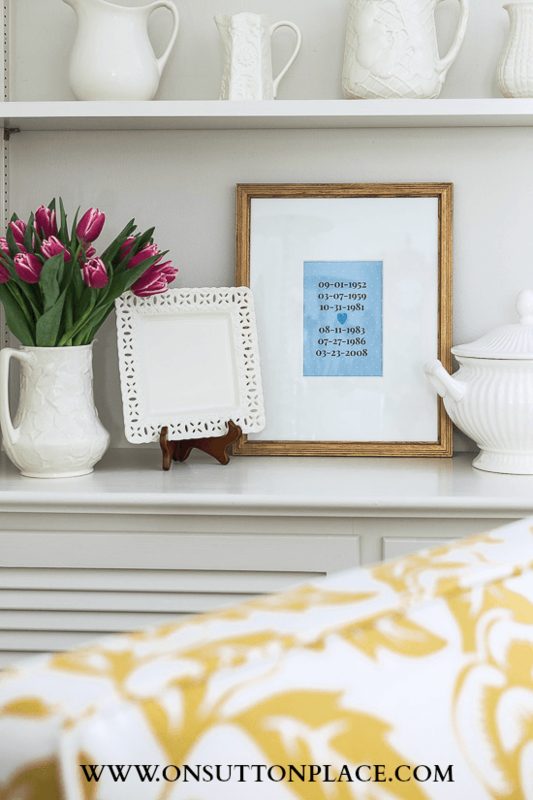 Oh my gosh…did I hear it from my kids! 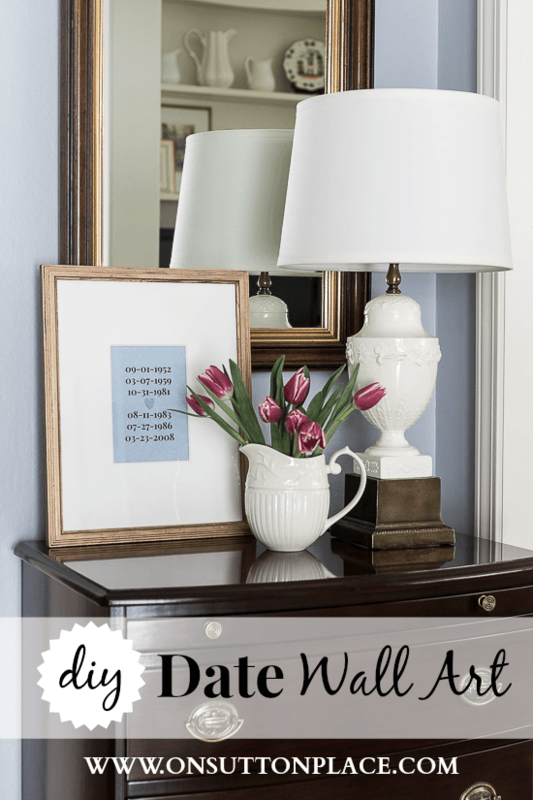 So I’m back today with a new and greatly improved tutorial to make your own DIY Date Wall Art. Your dates can be anything at all. Whatever you want that reflects your family. 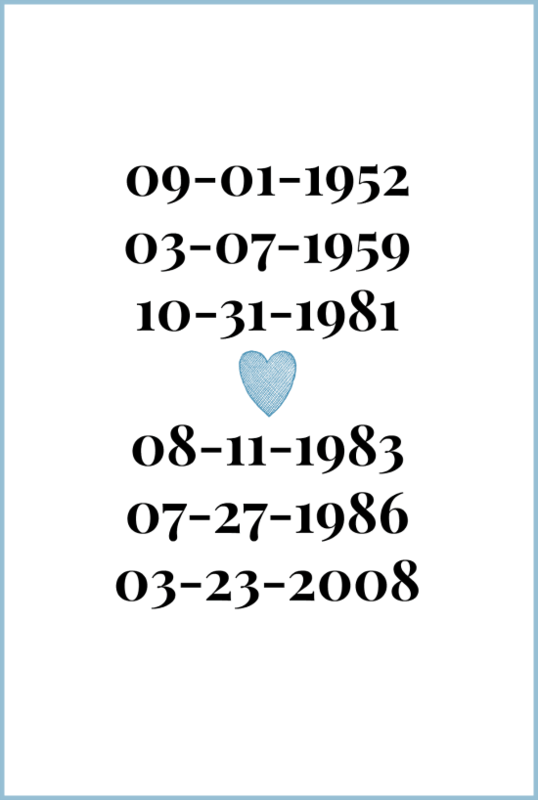 Design your dates in any sort of word processing program. I actually used PicMonkey but use what you are most comfortable with. Print them out on a piece of vellum. (Found in the scrap book aisle of any craft store.) Once you have your dates the rest is easy! 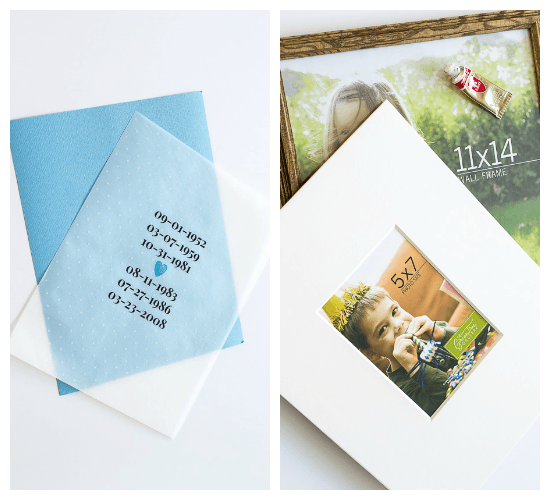 What you need: Your dates, a piece of background card stock/paper, frame, mat board. I got my frame, mat and papers at Hobby Lobby. The mat is the same kind I used in my DIY Watercolor Wall Art. 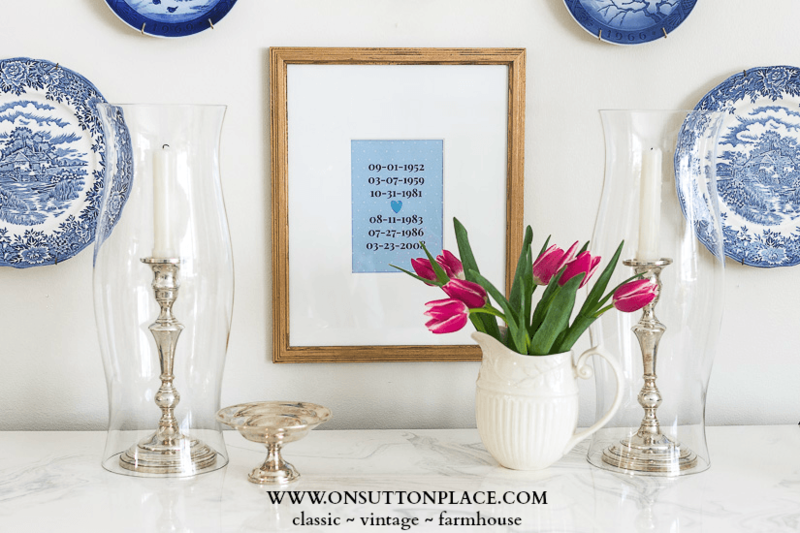 The frame was wood so I jazzed it up with some Antique Gold Rub-N-Buff (aff. link) that I had in my stash. Assembling the frame took literally less than 5 minutes. By using a piece of paper behind the vellum, it can be easily changed if you want a different color at some point. Cost of this project was about $8.00 because I had a 40% off coupon for the frame. If you shop regularly at Hobby Lobby, download their app on your smart phone. That way you will always have a coupon available when you are there. I am notorious for not remembering things like that! You might have noticed that I bought more tulips. I posted them on Instagram this morning too! I am simply unable to pass them by at the grocery without some hopping in my cart. I can’t remember a year when I have been so ready for spring. Any little hint of it that I can bring into my house is so welcome right now. P.S. Don’t forget to pin this! That’s a sweet idea. I love art that is personal. Nothing better! Ann, sometimes we don’t always have to be dazzled! Just a simple “Hey how are you?” is enough. I love your ideas and I especially love your white display of pitchers! My favorite color is blue but I don’t use it around the house, don’t know why, but I think I’ll put a dash of it here and there. I enjoy your emails so keep them coming because at times, my emails are all the conversations I see throughout my week. I just think this is the sweetest idea Ann! I love the simple sentiment to this wonderful decoration. I invite you to share at my hop today Hugs! That is such a neat idea! That looks so professional too. I bet that would make a nice gift for someone as a housewarming present or baby gift and include the dates for those. Thanks for sharing the tutorial. Love your tulips too. I think everyone is ready for Spring, but no more than the people that have been under piles of snow all winter (like you). I can’t pass by tulips lately either. I did this when you first posted it….it is hanging in my hall….and it is a favorite of mine! This is a great idea Ann. I also love all the vignettes. I saw this earlier today on Instagram and inquired about it. Thanks for sharing. I love it! The tulips are lovely as is the rest of your home. Oh, a lovely idea for my daughter’s family wall gallery. My white tulips probably are sharing their presence for the last time. I’ll be on the hunt for some perky pink tulips to brighten another wintry week in Ohio. Ann, this is a beautiful idea! I might have to make one for my stair wall gallery! Thanks for the inspiration! I love this idea! And your tulips are lovely, a reminder that all of the snow will soon (fingers crossed) be gone! Thanks for the inspiration!